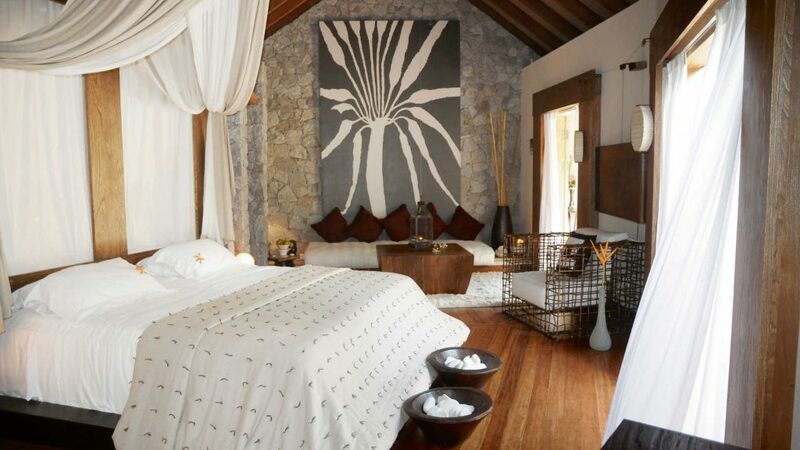 This intimate, elegant retreat blends rustic-chic with contemporary style and is perfect for couples. 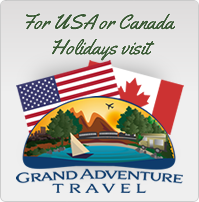 If you are looking for a relaxing break in a romantic setting, then this welcoming resort is ideal. Spend a couple of nights on the tiny picturesque island of La Digue, combined with one of the larger islands, such as Mahe or Praslin to get a real feel of the Seychelles. 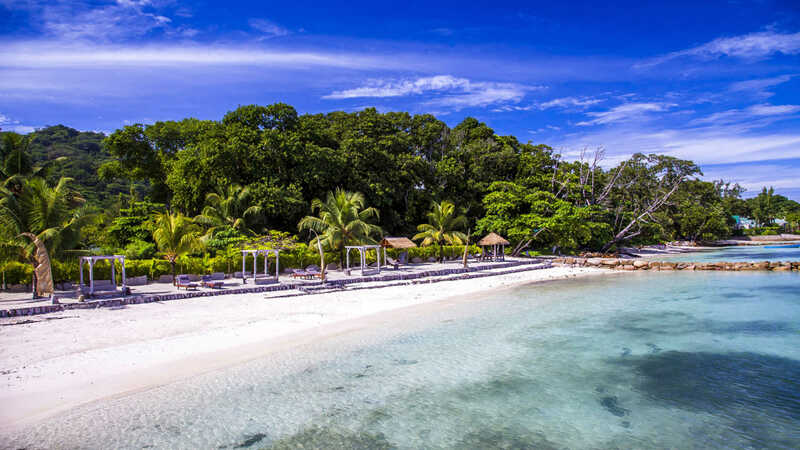 The resorts architectural style, plenty of warm wood, stone and thatch, reflects the natural beauty of the island which is studded with large pink granite rocks. The zen-style decor, seamless service and comfortable open-air areas create a soothing home-away-from-home. The resort is set in lush vegetation just steps from a beautiful white-sand beach and the offshore coral reef offers superb snorkelling. The stunning infinity pool overlooks the bay and the sleek sundeck is the perfect spot for admiring the sunset over the ocean and the mountains beyond. Le Domaine De L’Orangeraie receives great reviews Stunning natural setting A hilltop hideaway in a stunning natural setting. Anse Severe beach on La Digue Island in the heart of the archipelago. Approx. 20 minutes by car and boat from Praslin airport. 63 room, villas and suites. 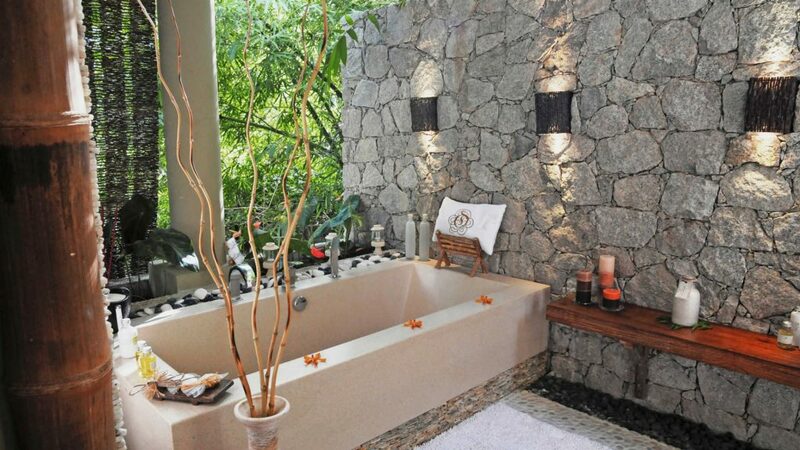 The treehouse-style villas are tucked away in the tropical gardens and scattered up the hillside. Buggies are available to whisk you up to the hillside rooms and the higher up you go, the more impressive the views are. Garden Villas are set at the bottom of the hillside closer to the facilities while the Villa de Charme are set on the slope of the hill and feature an outside bathroom. Garden Villa – Located in the garden at the bottom of the hill, these charming rooms offer views of the surrounding vegetation. With air-conditioning, ceiling fan, television, Wi-Fi, rain shower, bath, tea and coffee facilities, balcony or terrace, 60m in size. Villa de Charme Elegance – This wonderfully secluded villa features an expansive balcony or terrace, outdoor bathroom and whirlpool bath, plus incredible views. With air-conditioning, ceiling fan, flat-screen television, dressing room, Wi-Fi, minibar, shower, tea and coffee facilities, 100m sq in size. he all-day dining area is home to two restaurants that offer Mediterranean and Creole dishes. Head to Le Combava on the roof terrace for a la carte dining with an emphasis on seafood. Tuck into the catch-of-the-day and watch the sun set over the ocean from the deck at Santosha which also offers a buffet breakfast, live cooking station and international and Creole dishes. Sip cocktails in the elegant open-air lounge bar overlooking the lagoon, or at the casual pool bar. 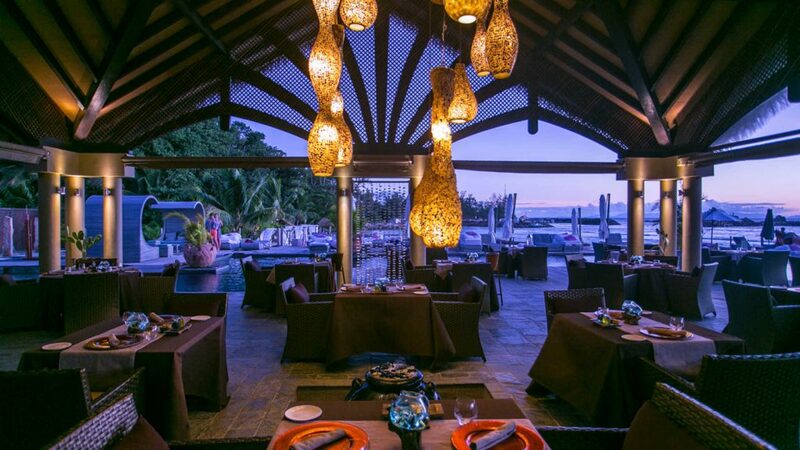 Le Combava occupies the upper deck of the all-day dining area and offers an Ã la carte menu of local and international dishes accompanied by fine wines. Enjoy a tasty buffet breakfast and international and Creole for dinner at Santosha which offers an al fresco setting, stunning ocean views and a live cooking station so that you see the expert chefs create your delicious meals. 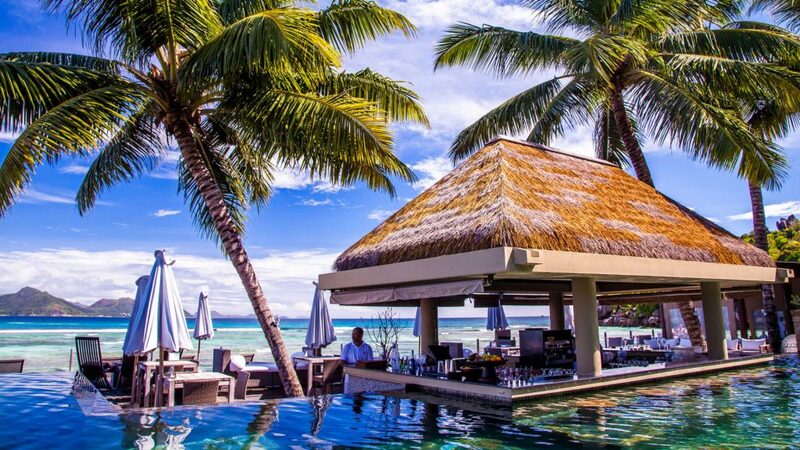 The L Alambic Bar offers an elegant terrace setting overlooking the lagoon and you can enjoy a tempting choice of cocktails at the casual Infinity Pool Bar. The stunning Eden Rock Wellness Centre and Spa is perched upon a peak and offers magnificent views over the lagoon and offers its own range of products, Nourished by Nature. 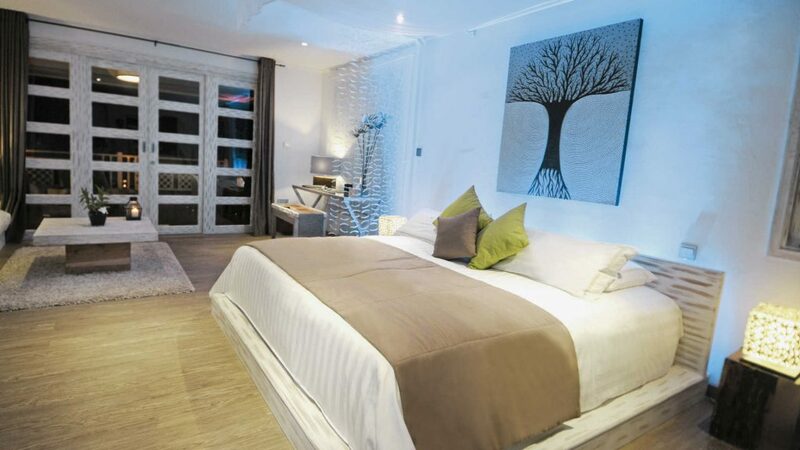 Facilities include single and double massage rooms, a Hammam and a lounge.